I am so happy to see Friday! For whatever reason, this week has gone by so slowly. I am more than ready to have Conor off work for two days! My big project for the weekend will be to sew Liam's Halloween costume (he's going to be an owl). I have all the materials, but that's as far as I've made it thus far. Wish me luck! Anyways, here's what I'm excited about this Friday. Thanks to Darci and the girls for hosting. I made this Blueberry Croissant Puff for breakfast last Sunday, and it was to die for! It didn't take me long at all to throw it together, and then Conor & I took Liam for a morning walk while it baked. It was a chilly morning, so this hot breakfast was the perfect treat to come home to. I already want to make it again! While we're talking about recipes, I thought I would mention one of my favorite gift giving ideas: a Tastebook! I had one made for my Mom a few years ago for Christmas. I included many of the recipes she has handed down to me, as well as new ones that I have come up with or discovered. It's so easy to input your own recipes, although it can be time consuming. 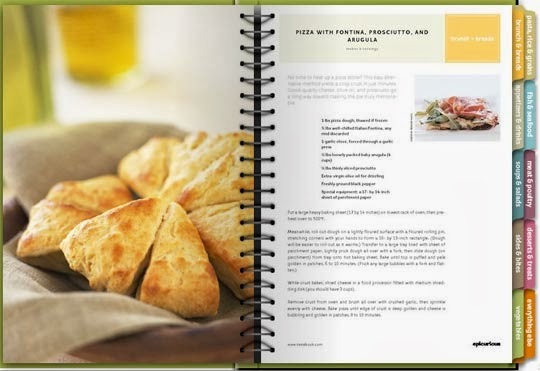 I especially love that there is a dedication page and that you can add your own pictures to each recipe. For some I included pictures of the actual dish, but others I just used pictures of my mom & our family in the kitchen over the years. Another added bonus, is that Tastebook has an app, so I can always access my recipes on my phone or ipad, which comes in handy when I'm at the grocery store and can't remember everything that goes in a recipe. This truly is "the gift that keeps on giving" (too early for the Christmas Vacation references?) because each year I add more pages to my mom's book and put them in her stocking! I am currently obsessed with gold polka dots! Which is actually funny, because I'm usually not a fan of gold colored things at all! If I had a little girl right now, I would totally put gold polka dot decals on her nursery walls! Instead I will have to settle for something a bit more subtle... 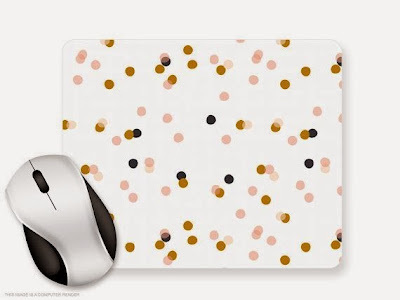 This gold confetti mouse pad is adorable and might need to make its way next to my new computer! With Halloween right around the corner, the festive TV specials will soon be hitting our screens! The Great Pumpkin Charlie Brown is such a classic that I look forward to every year! I'm also a huge fan of Scared Shrekless; if you haven't seen it go to youtube now! At 15 months old, we had never let Liam watch any cartoons until this week. Sure we have sports on the TV during the weekends, but Liam had never watched any children's programming. He is much more interested in books & interacting with Conor & I, so we had never introduced it. With the holidays approaching, I am excited to watch some of my favorite holiday specials with him and have family movie nights, which will be a big treat! 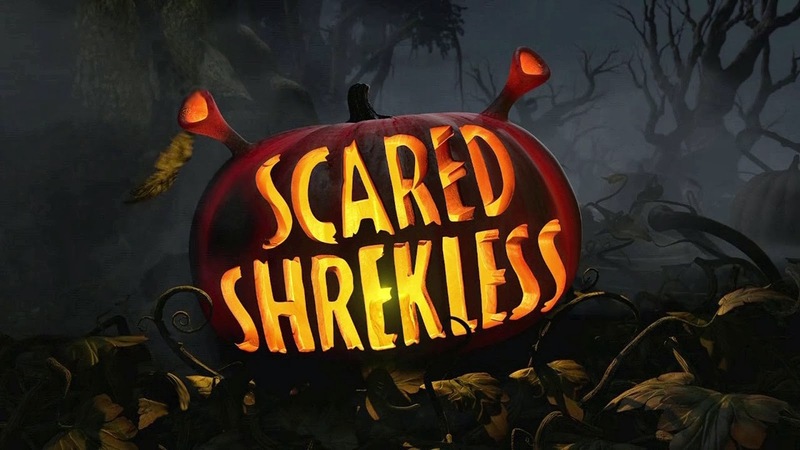 Two nights ago, we snuggled up the couch for Scared Shrekless. Liam was completely enthralled (especially with Puss in Boots... he kept pointing and meowing) for a good 10 minutes. Then he started getting restless and brought me a book to read instead. He melts my heart! but in this house, we always get froyo after! Can't wait for that! I'm seeing a Blueberry Croissant Puff in my future!!! Looks delish! Hope you have a wonderful weekend! That blueberry puff looks amazing! I will be attempting that recipe asap. And I too am obsessed with gold polka dots. I think it's something in the air ;) Happy weekend! You won't regret making the blubbery croissant puff, it's seriously amazing! Oh my gosh, that ravioli is so cute! I'm totally going to pick some up this weekend! Do it! They are adorable & tasty! It is soo delicious! Everyone needs to make it! Thanks! Every once in awhile I'm tempted to cut his hair, but I love it too much! Glad to see it's appreciated by others! Those raviolis are adorable!! Loving the gold polka dots right now too, they're everywhere!! It's the Pinterest effect... Making us all think we need some gold polka dots in our life! I love Costco! They seem to always have cool raviolis for the different holidays! We've bought the Christmas trees, hearts for Valentine's Day and Shamrocks for St. Patrick's Day, but never the pumpkins and bats! Gonna go get them today! So fun! And that Blueberry Croissant Puff looks so YUMMY!! This is the first time I've seen holiday ravioli; I will have to keep my eye out from now on! And definitely make the blueberry croissant puff, you won't regret it! That blueberry croissant puff looks absolutely amazing! Can't wait to try it for the holidays! Thanks for sharing! It would be perfect for any holiday breakfast! Hope you enjoy it! Your breakfast looks yummy, and like something my toddler would totally try! I am falling back in love with gold and polka dots as well, but haven't really figured out where to tie them in! I'm thinking maybe burlap placemats with gold polka dots on them?? Burlap and gold polka dots would be the perfect combination! I'm also obsessed with burlap at the moment! Good luck with your visit! Hopefully there's not too many tears. And fro-yo makes everyone happy! I need the blueberry croissant puff ASAP. Thanks for sharing.